Steps away from our resort you’ll find a few of our favorite open-air, waterfront restaurants and bars with the best seaport views and happy hours on the island. 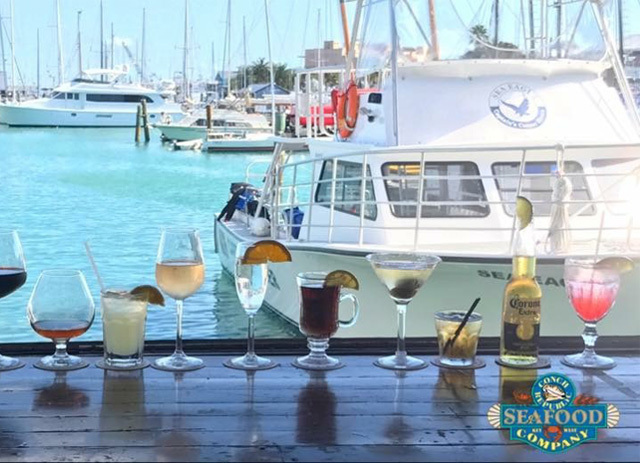 You don’t have to go far to enjoy the happiest of hours in Key West. Each one of these establishments offers a casual fun atmosphere with a view and some unique island experiences you won’t find anywhere else. Before or after your Seaport Happy Hour Stroll head over to Cero Bodega, our poolside bar, and enjoy $2 off drinks and $5 small plates. Happy Hour at Cero Bodega begins at 3:30pm. One of our favorite places to enjoy Happy Hour and sunset is the Tower Bar at Turtle Kraals. In addition to the food, drinks and happy hour specials you’ll have a front row seat to a spectacular sunset in paradise. Did you know: There’s something extra special happening here, it’s the evening Turtle Races. One of the must-see-and-dos in Key West is to watch and/or take part in the Key West Turtle Kraals Turtle Races held Monday, Wednesday and Friday at 7pm. Slow and Steady Wins the Race! Here’s how you can participate: starting at 4:30pm grab a free numbered ticket from the bartender and enjoy cocktails and a bite to eat. You’ll know when the race is about to start as crowds will gather to watch four box turtles scurry from start to finish. If your ticket number matches the number painted in tape on the back of the winning turtle, you’ll get a key and chance to open a treasure box with cash prize inside. Please call the restaurant for Turtle Race summer hours as the heat does impact our little friends. ½ off Beer, House Wine, Well Drinks. We continue our Seaport Bar Stroll and next on the list is our neighbor, The Waterfront Brewery, a working brewery, restaurant and entertainment center. When we say you don’t have to go far to enjoy the happiest of hours we really mean it. When you walk out of our resort you’ll see this dining and drinking establishment. Happy Hour at the Waterfront Brewery is from 4:30pm - 6:30pm at the bar and all waterfront brewery beers, well drinks and wines by the glass are half price. Did you know: There is a rotating selection of beers brewed right here in Key West at the Waterfront Brewery and you can check (online) what’s on tap today . Brewery Tours are also available 5pm every Thursday and 2pm every Saturday. The tours are $10 per person, 30 -35 minutes and in addition to learning and tasting new beer you’ll even get a souvenir Waterfront Brewery pint glass filled with beer! The Brewery Tours are fun, interactive and another cool thing to do while visiting Key West. At the foot of William Street, just steps from our resort, on the Historic Harbor Walk is where you’ll find Schooner Wharf Bar, “a last little piece of Old Key West.” There’s no glitz or glamour just one of the iconic places you must visit. It’s an open-air hangout with great drinks, live music and one of the few places that offers two happy hours: 7am - Noon and 5pm - 7pm. It’s mixology at it’s best and we aren’t just talking about the drinks. It’s about people you are about to meet, the stories and storytellers, the entertainment and the atmosphere. It’s also about the views, food and drinks but you will definitely take a step back into old Key West when you step foot in Schooner Wharf. This has been one of my all time favorite watering holes. It has so much character (with many characters walking past) and is a great place to stop and get something to drink and eat. If in Key West you need to treat yourself to a bit of "Old Key West." Last on our Happy Hour Stroll is the Conch Republic Seafood, another popular waterfront restaurant and bar with a cool Key West vibe located at the bustling corner of the Seaport. Early in the morning you’ll see the boats depart from the marina for a day of fun in the sun and water adventures. When they return one of the first places they are drawn to is the Conch Republic Seafood Company. It’s another fun casual restaurant with live music and great views of the harbor. Happy Hour is everyday from 4pm - 7pm at the Bar and Patio Only ~ 2 for 1 All Beer - Domestic, Import & Craft, 2 for 1 Premium Well Drinks, 2 for 1 House Wine. Who has the Best Happy Hour in Key West? We’ll leave that up to you but one thing is for sure there are plenty of bars and restaurants just steps away from our resort. If you happen to take the Historic Seaport Happy Hour Stroll share your photos with us on the social networks and make sure to use the hashtag #lovethemarker.